Kate and I were creating images for her model portfolio. This is one of our favorite images from the photo session and my favorite image for January 23. In addition to using a studio light up and to camera right to light her face, I had a studio light behind her to backlight the dress. Photo exercise, Graceland University, Lamoni Iowa. January 23, 2012. 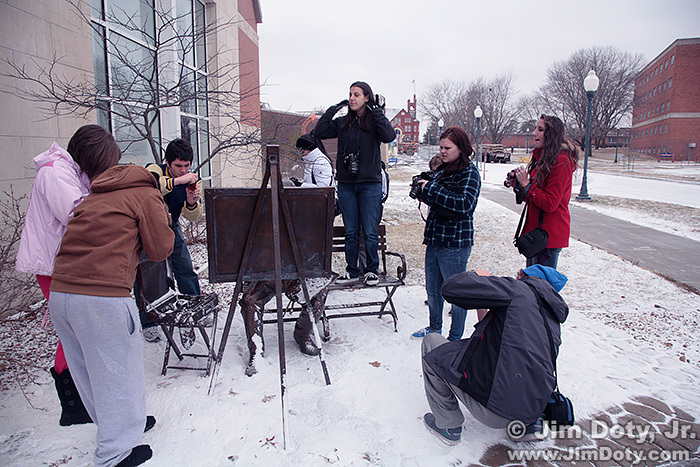 I did a winter intensive photography class at Graceland University. Every day we did one or more photo exercises during our morning class sessions, and some evenings we did photography field trips. Winter weather in Lamoni is often an issue, so we worked around the weather as best we could. This was an exercise in creativity and point of view. I asked everyone to photograph this sculpture from any possible angle and point of view. including or not including other people in the class. They could include all of the sculpture, some of it, and closeups of tiny details. This is my second place favorite image for January 23. If you have been following this series for a while, you saw images from other photo exercises here and here.